The kindergarten environment is more like a home rather than a classroom. A warm, secure and calm atmosphere is created where, surrounded by beauty, the young child’s imagination and creativity can unfold within their play and work. The children are not introduced to an academic program, but are simply allowed to be children. A great deal of what they need to learn at this age can be achieved through their own rich and rewarding world of self-directed play. The teachers maintain an unobtrusive, but loving and watchful presence. 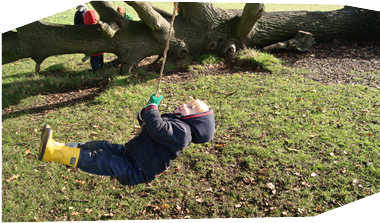 Our curriculum is based on our experience and understanding of child development and reflects the seasonal changes. Similarly, rhythm and routine give the child security and a sense of well-being. 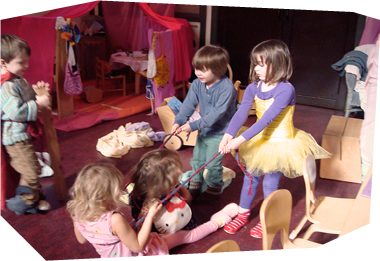 The children start with a period of free play where they create their own games. During that time, the children are also free to join the teachers in a range of wholesome, domestic activities, crafts and artistic pursuits. 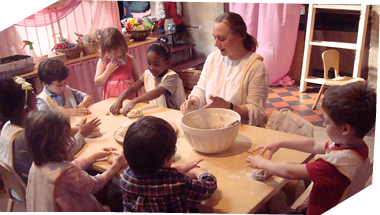 They may be involved in baking bread for lunch, working in the garden to grow vegetables, growing flowers, sweeping and mopping, washing dolls clothes and hanging them out to dry, weaving or sewing, painting, drawing, clay work. At the end of our play time, teachers tidy the domestic or artistic activity they were offering and children tidy up their games, putting everything back to its own place, ready for the next day. 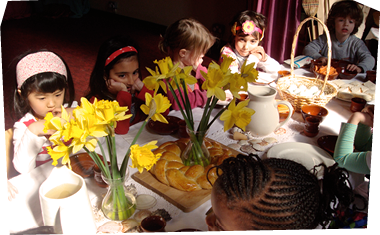 Some children help set up the lunch table, putting the right number of chairs, spreading a table cloth on the table and decorating the centre of the table. Following toilet time, we all sit together on the floor and have a drink before our circle time where we sing, recite verses and poems and do ring dances and finger plays. After having washed our hands, we all sit around the table for our lunch, starting with a short blessing on our meal. Lunch time is a very social time when children share their stories and adventures. Lunch is followed by time in the garden where children may play in the sandpit, the Wendy house, do some balancing on logs, running, or build houses and create games. 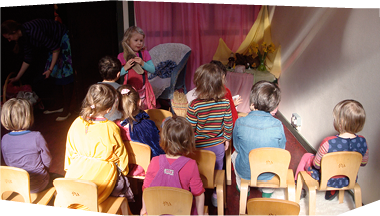 Following our garden time, children come back indoors for story time, where they are exposed to traditional folk and fairy tales and simple nature stories. The teacher provides the children with rich and beautiful oral language experiences which provide a wonderful foundation for the language work that comes later in their educational journey.